Matt Thompson over at Savage Minds has written a thought-provoking post about grading papers and the amount of time that academics dedicate to marking. I am thankful for blog posts that reflect on the practice of teaching anthropology. They are few and far between and I believe that teaching is too important to allow it remain so neglected. Let's be honest, anthropological training does not include any attention to pedagogical skills. It is up to individual educators as to how much time they devote to teaching and student development at the supposed expense of their own research agendas. From my experience, this can often mean little to no consistency across different classes and lecturers, a lax approach to educational standards, and a general disinterest in teaching except among only the few most charismatic faculty members for whom teaching comes naturally. Regardless of classroom manner, we can all agree that taking home hundreds of papers to grade is not appealing. I started teaching just weeks after I got my BA and throughout my PhD programme, well before US-style graduate teaching assistantships became as trendy in the UK as they are today. In fact, it was rare for first-year PhD candidates to be offered any classes and I was certainly the youngest teacher in my department (university?) independently taking a set of seminars when I finished my BA at 20. Although the memory of gainful employment now seems laughably distant from my current state of postdoctoral poverty, I was then fortunate enough to collect plenty of invaluable experience teaching, mentoring and marking hundreds of essays. Anthropologists largely assess their students through lengthy essays which test their ability to unite theory and ethnography with cohesive and thoughtful arguments. In practice, however, we grade poorly referenced regurgitation. Even a small stack of papers can take days to mark. 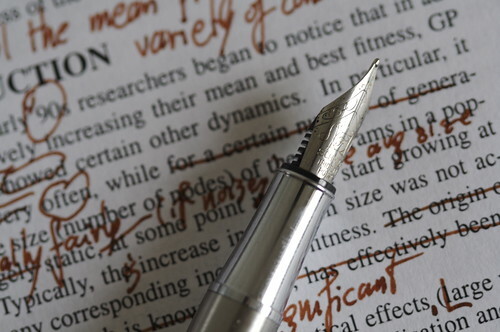 Early career academics and TAs are especially meticulous over-achievers when it comes to grading, devoting far too many hours to thoughtful annotations and helpful explanations, until the novelty of red ink wears off. That happens fairly quickly. There is no doubt that marking a mere 3-4 papers an hour just isn't feasible and nor is it the best use of our time as educators. Matt shares his helpful practice of lessening his marking load by requiring students to opt-in for detailed comments. If they choose not to, they'll receive a grade only. The opt-in idea that Matt offers is a good solution for those of us who habitually spend too much time reading, marking, re-reading, checking, etc. It makes infinite sense to let students choose up front and free up energy otherwise spent on wasteful over-marking. Or does it? Like countless other junior academics, I also began my teaching career by marking essays with careful notes for each student. It was time-consuming, but I continued doing so with the justification that it saves time later on in a number of ways. Especially in more intensive courses, you can get a lot of students contesting their grades, and after 100 or more papers, it's easy to forget what prevented a borderline B (UK 2.1) from reaching an A (UK first). Detailed notes help me recall better in these cases, even though certainly less than 30% take the words to heart. A few have even been supremely thankful for my taking the time. I take the academic writing part of assessment seriously, probably more so than most teachers I know. Hardly any of my students fresh out of UK secondary education manage to put a readable essay together, which has sadly come to be expected. Worse still is when their writing does not improve by their final year because not one of their teachers ever mentions how abysmal it is. Then we applaud their lack of literacy by awarding degrees and collectively scratch our heads when graduates either fail to become productive members of society or get accepted onto MA programs without knowing how to cite. And so the cycle continues. Yes, it's faster not to bother with things like grammar or punctuation. Indeed, I've even been instructed to ignore it. And that bothers me because it's unethical and devaluing. I underline, circle and cross out grammatical abominations as I read. It's an autonomic reflex. I let my students know early on the rubric that I'll use in marking their assignments, which includes academic writing conventions. Since there was never an academic skills requirement for native English speakers when I was teaching, I used to hold extra writing skills sessions with undergraduates on my own time (unpaid, of course, because PhD students don't count). As I see it, content, structure and argument are key. A paper without the appropriate conventions for writing and citation is not acceptable, regardless of how many books and articles the student has read. I am not dismissing that students need to be taught to "think" well, which happens in large part through discussion and debate outside of written assignments. But they must also be able to communicate those concepts and play an active role in the world of ideas that we're guiding them through. It's not enough to understand if you cannot also be understood. Marking is bound to be "unfair" to those in the top and bottom percentiles. This always bothered me immensely as a student and I do my best to rectify it when possible. I recall from my own undergraduate years that the best and worst of the class always got the least amount of feedback on their work. The latter are easily deemed lost causes, while the former excel of their own volition. That's not teaching. It's filing. I understand that formal grading is not helpful for everyone, but Matt's students trashing an essay without even reading the comments seems like a gross waste of tuition fees (especially when others hungry for knowledge and self-improvement can't afford to attend universities). Which begs the question, is it not counter-productive to encourage university students to customize their education so extensively that it renders the teacher and his/her input irrelevant to the experience of learning? Negotiation and collaboration with students to arrive at better learning conditions is good; reducing higher education to a fast food "value menu" is not. I get that a majority of students could care less what we think about their work. What I don't get is why our respective systems of higher education not only deem this attitude satisfactory, but continue to reward it.